The NFN Information Session on Coyotes was a Big Success! Late last year a couple of individuals made a deputation to council about the “disturbing” increase of coyotes in Norfolk County over the last year or two. They claimed that coyotes are a threat to pets and humans. Their angst was due to a small dog being attacked on a home owner’s driveway at night about 2 years ago and residents in Port Dover and Port Rowan (primarily) seeing coyotes in broad daylight. As a result, over the last few months of 2015 coyotes received a lot of local press and social media coverage. After some FaceBook exchanges with a number of persons, and a whiff in the air that Council was bowing to pressure from a few individuals, our Board of Directors decided to hold a special public information meeting to try to bring some understanding and clarification about the biology and habits of this highly adaptive and intelligent predator. On December 10th we hosted speakers from Coyote Watch Canada (CWC), at the Simcoe Research Station auditorium on Blueline Road. The response was overwhelming – over 100 people – resulting in standing room only! CWC is a not-for-profit organization, which has studied coyotes and coyote-human interactions for almost 20 years. Their organization provides public education on the biology and ecological role of these animals, as well as government consultation, and municipal wildlife framework models on how communities like ours can co-exist with coyotes. It was heartening to see that 3 councillors and a staff member attended the meeting. CWC’s executive director, Lesley Sampson, gave a thoroughly educational and entertaining presentation. The Eastern Coyote does carry wolf and dog genes but, based on DNA studies, cross-breeding occurred primarily a century ago as coyotes first started to move eastward from the Prairies, and gradually replaced larger predators (wolves and bears) in southern Ontario. The percentage of wolf and dog genes are small and inter-species breeding rarely occurs today, so that terms “coywolf” and “coydog” are a bit misleading. They are “coyotes” but there is no argument that those found here are somewhat larger than those found in western Canada. This has an adaptive advantage to bringing down larger prey like deer, especially when there is lots of snow. Coyotes are highly intelligent, inquisitive and adaptable. In rural areas they will approach built up areas because they often find a ready source of food. Solution – don’t leave garbage, compost, etc. out. Put in secure containers with lids. New infrastructure such as roads, fences and urbanization impacts how wildlife moves throughout our communities, often resulting in increased sightings. Urban boundary expansion creates a loss of habitat and green spaces for wildlife. The proliferation of housing in Port Dover explains, in large part, why residents are seeing more coyotes. 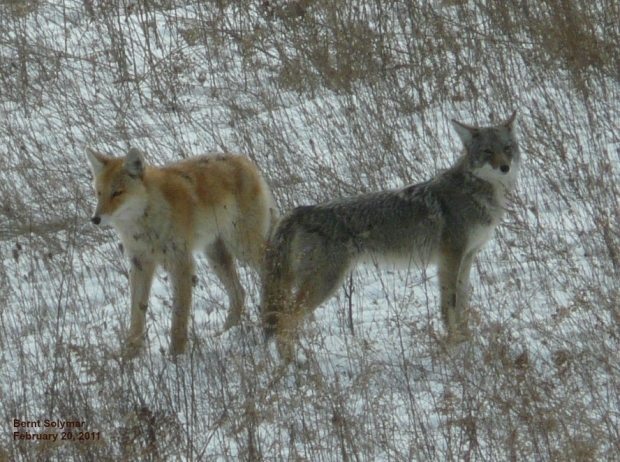 Coyotes are predators; in fact, top of the food chain in southern Ontario. As such cats and dogs become “fair game”. Pet owners that live in rural areas need to take responsibility of their pets by not letting them roam at large. Removing coyotes by shooting or trapping does not work. If anything it can exacerbate the issue. Lesley explained this is because coyotes hang in small family units. These “packs” have territories that, when they are exterminated, are simply taken over by coyotes from neighboring areas. The “new” animals do not have the knowledge of the territory that the former pack had and therefore tend to be more of a “problem”. Lesley dismissed the misconception that coyotes feed regularly on feral cats. She pointed out that a coyote isn’t very smart to tangle with prey that has teeth and claws and can fight back when there are easier prey items around like voles, chipmunks, rabbits, birds, etc. Finally, we received a Hazing 101 course. Hazing is a method of negative association that safely compels a coyote to move away from humans. This includes making yourself look big, yelling and throwing things at a bold coyote. Tin cans half filled with pennies, banging pots, and water hoses also work. The trick is to stick with it until you have forced the coyote out of your yard, farm, etc. The crowd was polite and obviously interested, whether they liked coyotes or not. There was a farming couple there that owned sheep and they were very upset about losing lambs to coyotes. Lesley was sympathetic (rightly so) and offered to visit them at a later date to provide some constructive advice on how to handle their problem. All in all a really good meeting with lots of great information and visual aids. A very good article covering this meeting in the Simcoe Reformer a few days later was a bonus.